In this post, we discuss when not to do paint correction. What’s that you say? A paint correction shop recommending against paint correction? That’s right! It’s not for everyone and in some circumstances shouldn’t be done at all. Many vehicle owners want to keep their second most valuable investment (after the house or condo) looking as good as new. Vehicle enthusiasts may spend hours waxing, washing, cleaning and detailing to get the pristine, gleaming “look” they desire. It becomes addictive! The downside of chasing the vehicle perfection dragon is that it can have a cost – to your vehicle’s protective clear coat and your wallet. A perfect example of this is paint correction. 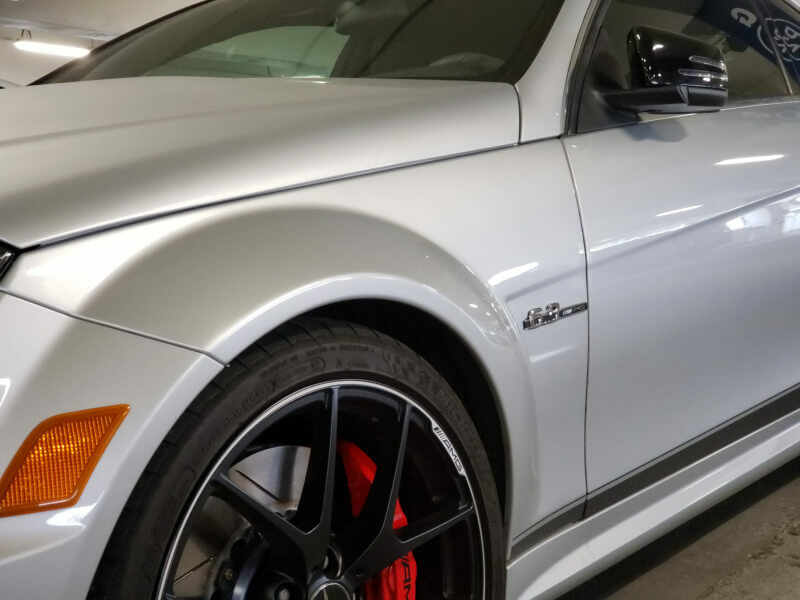 At Gleamworks Detailing, a Vancouver paint correction shop, we take great care to educate owners about the “how” “why” and “when” of the process. It’s not for everyone and sometimes, depending on many factors, paint correction shouldn’t be done at all. So, before you insist on paint correction as a remedy to that flawed finish, read the rest of this post. Paint correction is the process of cut polishing and buffing away imperfections such as scratches, swirl marks and spider webbing (caused by improper cleaning or drive-thru car washes), acid etching and fading in your car’s top coat (also called “clear coat” or “factory coating”). The process includes 1 or more rounds of cut polishing at the discretion of the technician who assesses the damage, notes its depth (is it in the clear coat or paint? ), measures the thickness of the clear coat, and chooses the appropriate tools and compounds to get the best result. If you are a daily driver or commuter who replaces or leases a new car every few years for the latest model, you are less likely to want paint correction, though even for you it can have benefits beyond aesthetics (trade-in value, resale value). This post is for the daily driver who values their investment, will likely keep the vehicle for some time, and wants to maintain it because they care about how it looks. The warnings about too much or inappropriate paint correction are also for those owners who are restoring or maintaining rare and valuable vehicles. The age and mileage of the vehicle. Whether the vehicle is well maintained and cared for, including the likelihood that paint correction would be negated by future damage and neglect. How often the vehicle is driven. Whether the vehicle is subject to extremes in weather or prolonged exposure to weather such as rain, snow, sleet, and sun. A vehicle kept in a garage or parkade is exposed to far fewer corrosive elements than a vehicle parked on the street. The owner’s expectations about the results of paint correction. Some vehicle owners want the technician to “go for it” regardless of the impact on the clear coat. They want perfection, a flawless finish, but may not consider that their vehicle’s clear coat has a finite thickness that must be safeguarded. Whether the vehicle has been repainted or has original factory paint. A car that has been repainted may not have had enough top coat applied and conversely, an older vehicle with original factory paint and clear coat may have too much surface damage to be remedied by cut polishing the clear coat. How long the person plans on owning the vehicle. As we suggested earlier, if you trade up ever couple of years, it may not make sense for you to undertake paint correction. You’ll have a shiny new car soon enough anyway! Whether it’s a vintage or collector vehicle, or, has great sentimental value. If this is the case, the technician needs to balance your need to keep the vehicle looking great with what’s possible and safe. Most of the time, paint correction is possible on older, well kept vehicles, collector or vintage autos provided there is enough clear coat. Whether the vehicle has had paint correction in the past, how many times it was performed and how aggressive that paint correction was. Gleamworks considers all these factors before restoring the top coat. We also highly recommend that if you do get paint correction, you follow it with paint protection (ceramic coating for example). Why spend money getting a near perfect finish if you don’t protect it from deterioration in the future? There is a lot of damage in the paint beneath the clear coat, so that cut polishing won’t give the desired results. Your vehicle has already had several rounds of paint correction. In that case, you risk removing what little protection is left. Gleamworks technicians measure the clear coat to ensure there will be a safe thickness left – enough to continue protecting the paint layer from the elements. If you don’t intend to invest in paint protection after paint correction is complete. Contact us for a free paint correction consultation and estimate. While we can’t fix deep gauges, dings and dents with paint correction, we can eliminate or reduce the appearance of most surface marring. In many cases, even if the damage has penetrated the factory coating into the paint beneath, correction followed by ceramic coating, can minimize the flaw to such a degree that it’s hard to find once the work is complete.